For many of us, winter is a time of the year that we don’t particularly look forward to. Of course, if hunting is your thing then it may well be that winter is your favourite time of year! And hats off to you for getting out there in all that mud and embracing all that the British weather can throw at you. But if you’re more of a fair weather rider, or indeed, would just rather not receive an ice-rain exfoliating facial treatment whilst trying to stay on your horse in gale force winds and maybe you appreciate the sensation of actually feeling all your toes – have no shame. It’s okay, accept it, shout about it. I guarantee your horses will not mind one iota if you skip a session. Use the winter to your advantage. Give yourselves and the horses a bit of downtime after what has undoubtedly been a jam-packed and fun-filled summer of activities. It’s good to give your horses a break and it will do no harm in the long run both mentally and physically. We’re not all lucky enough to have access to indoor riding facilities either, or perhaps any riding facilities at all. 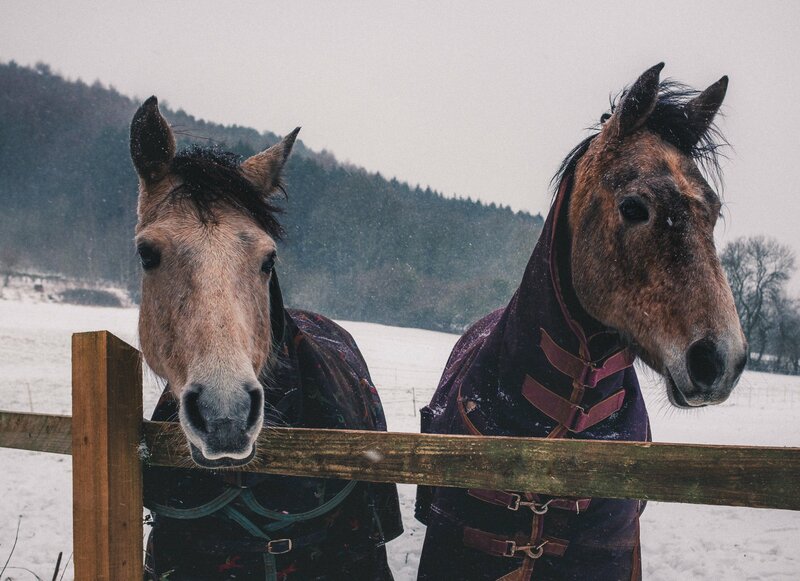 As the worst of the weather kicks in, the ground becomes frozen solid or saturated and there is the risk of pulling shoes or your horse sustaining injury by slipping. This means more riding on the roads, man-made tracks or arenas (if you have access to one). As a whole, riding just becomes more challenging and we haven’t yet mentioned the reduced daylight hours. It’s important to not forget that horses are superior athletes and can maintain their fitness far better than humans. Therefore don’t worry about skipping sessions when the weather is bad, a few days here and there will have absolutely no effect on their overall fitness. The important thing is to focus on the quality of the work, rather than the quantity. Having three quality sessions a week will be more beneficial than six sessions going along sideways in the rain and skating through the mud. The only word of caution is to re-evaluate your horses’ diet as with the reduced workload will come a reduced energy requirement. The last thing you want is your horse with excessive energy making his own merriment in the field. So do consider your horse’s body condition and if he is maintaining his weight well ad-lib quality forage and a balancer such as SPILLERS Original Multi Balancer will be all he needs in the quiet time. Couldn't agree more! In the winter It's so easy to overfeed & then confine horse to field or stable, with unmanageable results! Ad lib forage is important but treat balls can be useful too. And yes, horses do keep their fitness levels much better than we do. I learned that at the start of my 2nd endurance season; my horse's fitness was established within a few short weeks.